The standard set includes Z'roa, Charoset, Maror, Karpas, Chazeret, and Baytzah for $100 All minis are labeled on the reverse in English and phonetic Hebrew. Some traditions delete Chazeret as it is the same thing as Karpas only it is used in the Korech sandwich. The small set is as above without Chazeret. 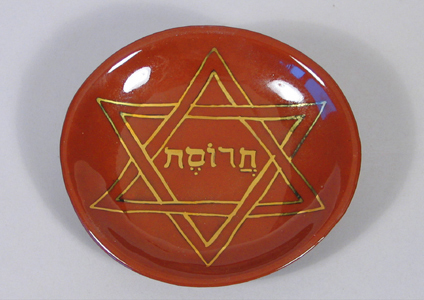 The Feminist seder plate features a place for the Orange. It is a symbol of our ability to grow with a tradition instead of being bound by it and recognizes that times have changed and we cannot exclude vital members of our community because of old prejudices. For the fascinating story of how this modern tradition evolved, visit Susannah Heschel's site at Miriam's Cup. The Feminist Seder mini is $15 and can be added to either of the above sets.